If you're after a centrally located villa with the beach right on your doorstep Villa Almar is the perfect choice. This property is located only a few minutes' walk from the sandy Playa Pocillos Beach as well as a selection of shops, bars and restaurants. The centre of Puerto del Carmen, with its lively Strip and Playa Grande Beach, is less than 10 minutes in the car. Air conditioning/heating in the bedrooms and lounge, a heated pool and WiFi are included. The fantastic location with the beach virtually on your doorstep. Plus, shops, bars and restaurants are within walking distance. The outside terrace is great for soaking up the Canarian sunshine on one of the sun loungers by the private oval shape swimming pool which is overlooked by a beautiful mosaic of jumping dolphins on the wall. There is a shaded terrace area with a dining table and chairs overlooking the brick BBQ making it perfect for alfresco dining and for those wanting some shade. There is also a poolside shower and palms adding a touch of colour. The main front door opens into the hallway. The parking for your hire car is on street. The lounge is open plan with the dining space and has a comfortable seating area, a flat screen TV and a dining table and chairs, as well as access to the pool terrace. The archway leads to the adjacent compact and well-equipped kitchen with ample storage units. Villa Almar is all on one level and has 3 bedrooms - 2 twins and 1 double - in total. The double bedroom has an en suite bathroom and there is a separate shower room. Villa Almar is a delightful semi-detached property within 5 minutes' walk from the picturesque Playa Pocillos Beach. What's more, a good choice of shops and restaurants are within walking distance. There is a promenade that takes you along the coast to relaxing Matagorda in one direction or in the opposite direction is the livelier Strip of Puerto del Carmen. The resort centre can be reached in less than 10 minutes in the car. The closest mini market is 130 yards away from the villa with a bigger choice a little bit further. What's more, the shopping complex in Matagorda is 20 minutes' walk away. The main Puerto del Carmen Strip is lined with shops where you can buy your daily essentials, clothes, perfumes and much more. The Biosfera Shopping Centre has something for everyone! There are 4 floors of shops and restaurants overlooking the old town of Puerto del Carmen. There are bars and restaurants within a few minutes' walk from Villa Almar. Alternatively, you can try restaurants in Matagorda Shopping Complex , 20 minutes' walk away or a few minutes by car. If you're after a livelier vibe, then Puerto del Carmen Strip is the place to be! There is every type of restaurant you could possibly want, from Spanish tapas and tasty Italian to spicy curries and many Asian style restaurants. There's also the good old British bar with traditional English food, and not forgetting the Irish bars with live music most nights. Villa Almar has the best of both worlds - a private swimming pool and the sandy Playa Pocillos Beach only a few minutes' walk away. Playa Grande Beach is within 10 minutes by car or 30 minutes' leisurely stroll along the coast, and Matagorda Beach is less than 15 minutes' walk away. Rancho Texas theme park is a 5 minutes' drive away from Villa Almar and has animals from all over the world with a must-see bird show. By night it transforms into a Cowboy and Indian theme night with BBQ, line dancing, disco and fun for all the family. The volcanic area of Timanfaya is only a 20 minute drive passing the wine growing areas of La Geria and the pretty villages of Yaiza that has restaurants with a Canarian kitchen offering tapas, local wines and dishes typical of the island. There is an 18-hole golf course located behind Puerto del Carmen. A more established course is also available in Costa Teguise located on the East Coast. A pitch and putt course can be found in the Hesperia hotel in Playa Blanca. Throughout this beautiful island, you will find many examples (wind sculptures, monuments etc.) of work by the famous artist Cesar Manrique. There are also volcanoes, vineyards, spectacular rugged coastline and powder white sand beaches to be explored. Villa Almar is not available to book for season as it is sold out. 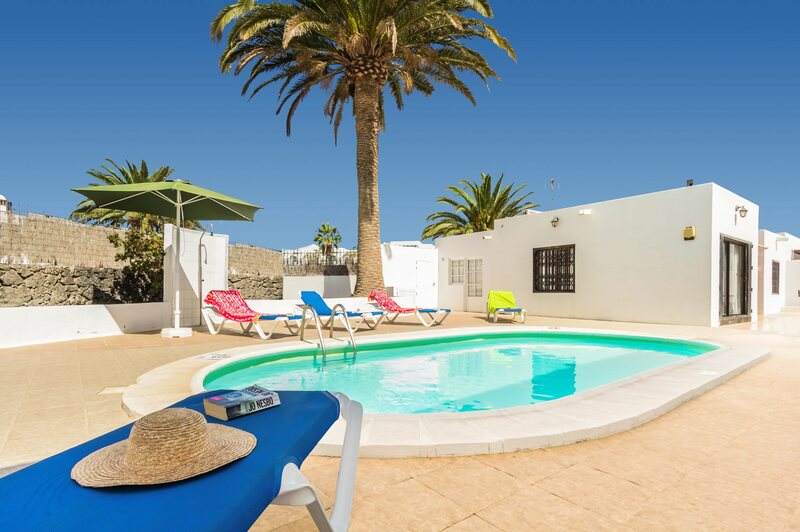 Take a look here at the Lanzarote villas that are currently on sale. More space than expected ! Excellent location. All of our family had a fabulous holiday. Very nice villa, good position for beach, restaurants and shops. We had a brilliant holiday, it was fabulous and we would stay there again. Many Thanks. The villa was in a lovely position, close to everything. It was lovely and spacious, with an excellent pool terrace. We enjoyed staying there and would certainly use Villa Plus again. Great location, great space for family, would book again. Loved the villa and it's proximity to beach, shops and restaurants. Great BBQ area and well recommended for a relaxing break. Alison the rep, really helped us out when we decided to extend trip. Would highly recommend Villa Plus and will definitely book again. Fabulous villa in a superb location - spacious both inside and outside - would highly recommend! We booked through Villa Plus after having a superb holiday with you to Majorca a few years ago. The arrangements were all very good and the villa met our expectations. The location and amenities were excellent! It was excellent. All went smoothly. I felt very well supported. The food welcome pack was exactly what I would have purchased myself. Thank you. A stress free holiday! Great location and everything was clean and easy to use. We had a great holiday - the villa was very spacious and met our needs and it was great that the pool was heated. Thanks for a realy good holiday! First time with Villa Plus, will certainly be using again. Lovely location.